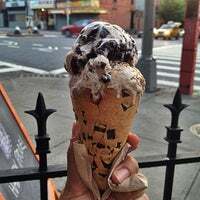 The best ice cream in New York City. Hands down. Salted crack caramel is aptly named. If pistachio squared is available, get it! The Ooey Gooey will bring you to a buttery heaven. Just get it all! 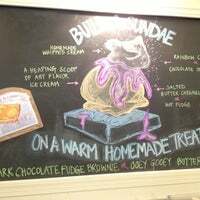 Named after a line in a Walt Whitman poem - "I too lived - Brooklyn, of ample hills, was mine..." People talk about the salted crack caramel but my fave is the Ooey Gooey Cake. It's so hard to choose one favorite flavor, so change it up each time you go. Definitely try the chocolate chip cookie cone at some point, though. Perfect stop before or after a walk to Prospect Park. After spending an hour trying all the famous flavors I decided to go with a underrated flavor which was a balance between salty and sweet, the munchies has mini m&ms and potato chips, it’s amazing! Don't miss the Salted Crack Caramel, an intense and just salty enough butter caramel ice cream that gets even better with "crack cookies," buttery chocolate-covered Saltines. I'm typically a chocolate guy when it comes to ice cream. The Ooey Gooey Butter Cake (the creamiest vanilla ice cream with hunks of St. Louis-style Ooey Gooey Butter Cake) is STILL one of my faves. Awesome ice cream. Really fresh and the best ingredients. However sometimes consistency is a little off but it makes it more fun to eat! Try the pretzel cone YUM!!! This is the original location. If you can't decide get the ice cream flight, 6 flavors(each scoop is about the size of an egg). They have some outdoor seating. Takes you back to childhood with creative mix in for your now adult self (munchies, the dude, white russian, ooey gooey...) what's not to love when they let you taste as many flavors as you want. Best ice cream possibly ever! Salted pretzel cone x Salted Caramel (Crackamel) ice cream is heaven. Don't even need the special cone, really just got it to have tried it once for novelty. This is, with no exaggeration, the best ice cream place I've ever been and almost certainly the best ice cream place to which I'll ever go. 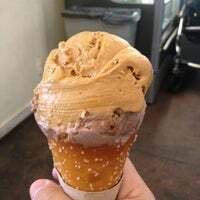 Salted Crack Caramel, Ooey Gooey Buttercake, waffle cone. The line is always long, but it's well tended and moves quickly. Get The Raw Deal or Chocolate Milk & Cookies if you like chocolate and chunks. You seriously can't lose. It's all money. I would roll with peanut butter cup or oatmeal cookie but you do you. Sample everything. Hot fudge is also good if thats your thing like it is mine. For a Jaws-inspired treat, try Beneath! This custom batch features beer ice cream made from Magic Hat Circus Boy with "bloody" honeycomb & crunchy nuggets of Ritz crackers, pretzels, and potato chips. I love an ice cream that is so chock-full of ingredients that you don't need to order any toppings. They always have a great flavor selection and their ice cream is super creamy. Gorgeous ice cream & homemade cones. Very friendly staff. Excellent service:when one staff member gave us the wrong flavor, another corrected it with no fuss and gave us an extra scoop to boot. Few scoop shops in this city make ice cream as good—and as fun—as Ample Hills. On your first visit, definitely try some Salted Crack Caramel. 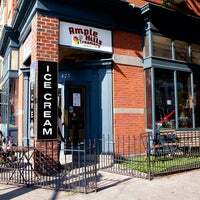 Village Voice is proud to welcome Ample Hills Creamery to the 2014 Choice Eats food fest! http://bit.ly/1cRzdNV. The Salted Crack Caramel flavor will cause symptoms of withdrawal. 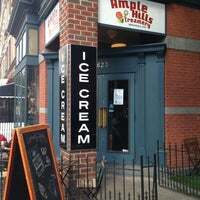 VONY FB group comment: "Ample Hills always has a couple dairy free options (most of the time they're also vegan, just ask). 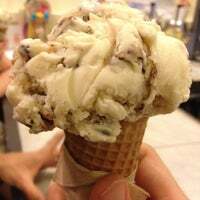 Get the chocolate gelato if they have it..."
There's a reason there's a perpetual line in this ice cream shop. Flavors are all delicious across the board, but the Salted Crack Caramel and Cookie au Lait are worth a mention. 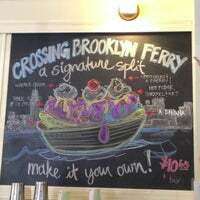 best ice cream in Brooklyn, maybe even all of nyc imo. salted crack caramel is life changing and the sweet as honey is divine. Pistachio has been my favorite since i was a kid. Tasted it around the globe.... 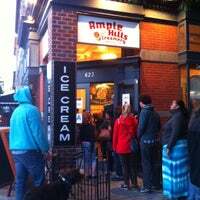 Ample Hills has THE best pistachio I've ever had. 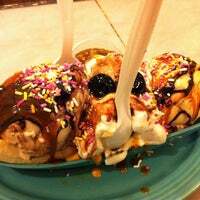 If you stopped by here, definitely don't leave, grab a scoop, or two, or three, e.t.c., definitely the best Ice Cream spot in the NY Tristate Area. I recommend the Salted Crack Caramel as a first try! Make sure to check their Facebook page for regular flavor updates. Ooey Gooey butter cake is like eating the creamiest vanilla ice cream littered with pieces of decadent butter cake from St. Louis. The password for free WiFi is 'leavesofgrass' which is the name of a poetry collection by Walt Whitman (1819-1892). Note the short excerpt from his poem 'Crossing Brooklyn Ferry' above blackboards. The quirky astroturf-covered exterior is the only thing that’s not 100 percent natural here. 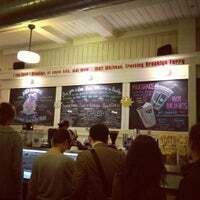 Organic ingredients and hand-churned scoops keep ice cream lovers of all ages wrapped around the block. No point offering fave flavors cuz they add delicious new ones all the time! (Some perennials like salted crack caramel are always there.) Get a spiral cone when they have 'em—delicious, all too rare. The 30s ice cream with those delicious red velvet cake chunks! oh God yes! 😳😖 it's like the reverse of ice cream cake, cake ice cream? Just know it's good. Great. Amazing. Long lines for ice cream sound crazy, right? Not when the ice cream is this brain freezingly good. Simple sugar cone with ANY flavor will make your summer day. Give the pistachio a try, it's aces! Tasted Horchata, Strawberries & Cream, Pistachio, Dark & Stormy, & Caught in the Rain & think award-winning Salted crack caramel is da bomb! Best ice cream in New York. Try the Salted Crack Caramel for a solid flavor, but the weirder it sounds, the more of a slam dunk the flavor is bound to be! 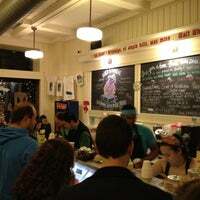 Check their Facebook page for their daily menu of 24 hand-churned flavors. 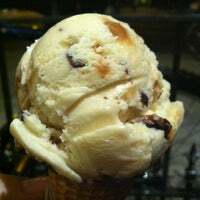 Mainstays like Salted Crack Caramel and Nanatella are top notch. Salted Crack Caramel is... a very dangerous thing. Mexican Hot Chocolate was good. They had a flavor, Moroccan something that was mint with fig in it. Go for the crack, but the rest are good too. Some of the BEST ice cream I've ever had. Salty crack on pretzel cone. caramely/salty, not too rich. The pretzel cone is kind of thick however...not necessary for the experience. Open all year-long makes this a dangerous place. Always an impressive selection of ice cream flavors & combos, and a history lesson attached for the nerds (and kids) in us all. The original branch - there's a bigger branch on Nevin's St now with a rooftop alfresco bit - but this branch is great too even if small. Order the salted crack caramel. Prepare for long crowded lines. 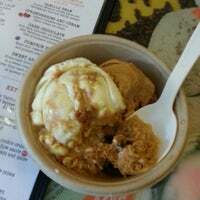 Ordered the salted crack caramel and the ooey gooey pound cake ice cream. Very disappointed in the crack caramel, very bitter and salty! Loved the pound cake ice cream! My favorite flavor is peppermint patty, but all the flavors are great. Get a chocolate chip cookie cone if that kinda thing sounds tasty. Not just ice cream but THE treat you need. All flavors are great but I recommend "the cookie that crumbles". Tip: always ask for one sample... Or more! Homemade ice cream made all on the premises with fresh, local, all-natural milk, cream and eggs. Brooklyn's freshest! 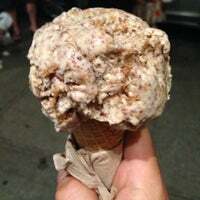 "Possibly the best ice cream in NY right now. Crazy flavors like chorizo caramel swirl and miso cherry butterscotch. Whatever you choose make sure to get it in a waffle cone." "Staff Pick! 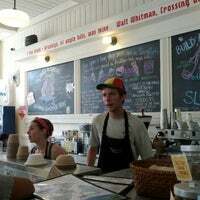 Katie (Curatorial): Sea salt brownies and fresh sorbets are amazing. Fresh muffins and baked goods from Blue Sky Bakery (rasberry-zuchinni-dark chocolate muffins--yum!)" "stracciatella gelato brownie a la mode sundae"
"Excellent onion rings and $3 drafts at happy hour includes a great beer selection." "Great chill obscure music with a stunning selection--the kind where you can actually just browse and find some true gems. Intimate readings in their basement (winter) and backyard (warmer months)." "This park is absolutely gorgeous with many different trails for hiking. The Picnic House area is excellent for having a bbq - but you have to show up really early (7am) to secure a spot."